We’ve all been there. You find a piece of gear that fills some need that you have. It’s made from quality material, it’s made in the USA, and it’s beautifully designed. It couldn’t have been more perfect if you designed it yourself! But then you scroll down and see the price tag. Damn, all that sleek beauty and quality craftsmanship comes at a price. A big one. So you get on eBay to look for a used one. Maybe you’ll save a little money on a lightly abused model. Then you see it. Isn’t that the thing, the perfect thing, that you were just looking at? And it’s only 1/4 the price! Never mind that the listing doesn’t mention the manufacturer’s name, and it ships from Hong Kong! Here you reach a vital point. Do you save some money and get a product that is 99% of the time going to be lower quality and much rougher, or do you hold out and buy the real deal? What about the ethics of buying counterfeit goods? On the one hand, it’s the free market, right? If someone can make the same product for less money they’ll win in the end, right? Just try not to think about the shoeless child slaves sweating away in a hot factory. On the other hand, someone worked hard, they poured themselves into a design, they took their time creating something beautiful. Then they found a manufacturer that was honest, used quality materials, and didn’t cut corners. They kept production in the USA where the money could better bennefit the nation’s economy. Oh, and the folks making the real one have shoes and safety glasses. This is nearly the situation I found myself in when a purchased a counterfeit MS4 sling. I had been looking for a quick adjust sling with QD studs for a while. There were a few options out there, but they were pricey, and I didn’t want to buy anything until I had handled some of them and could decide what design I preferred. 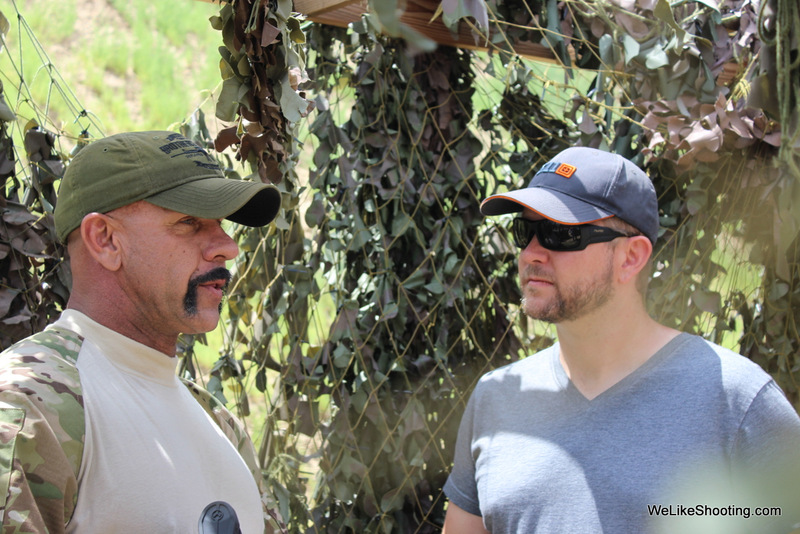 Unfortunately, hunting season was rolling in fast, and hunting without a sling isn’t much fun. So I hopped on eBay to find something cheap that would hold me over until I could make up my mind on a higher quality sling. Without much effort, I found a sling that had QD studs for about $15. I glanced at the pictures, thought to myself “huh, kinda looks like a Magpul sling” and hit “Buy it Now”. A week or two later the sling arrived. I opened the package and found a cheap sling with poorly cast pot metal and Magpul logos everywhere. Oops. A couple of days later I went out and purchased a real Magpul MS4, and thought it could be interesting to do a comparison. What follows is an excruciatingly detailed description of the two slings. If it’s just too dry for you, you can skip to the bottom to see a quicker comparison. Starting at the QD swivel on the far end, the real Magpul has a gently beveled edge on the tip of the swivel. The ball bearings that pop in and out of the swivel sit in nicely machined ports. The counterfeit sling has a sharper edge, a face that suggests tool height needs to be adjusted in the machine it was made on, and some ugly markings around the ball bearings. The button on the genuine sling protrudes slightly farther from the swivel and is more cylindrical while the counterfeit has a nearly flush button which is a shallow dome. The finish on the genuine swivel is a flat black parkerizing while the counterfeit has a slightly glossy finish. The rings on both swivels have casting marks. The barrel on the genuine QD swivel also appears to be larger than the counterfeit. 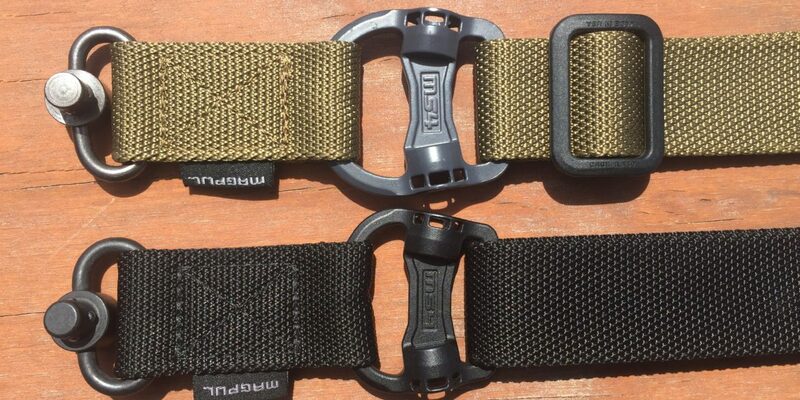 Both slings feature a tag that reads “Magpul” on one side and “MS4” on the other. The genuine tag is black with clean grey lettering. The counterfeit is black with messy white lettering. 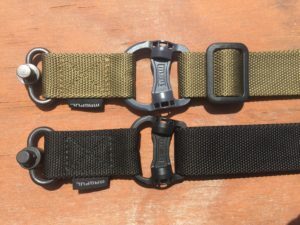 Each sling has an “adapter” to allow the sling to be used in either a single-point or two-point configuration. Both adapters have “MS4” molded into the front side. The type is slightly different on the two adapters. The genuine adapter is printed “MADE IN USA 1LX50 iP.MAGPUL.COM”. The URL leads to a PDF file that contains a list of Magpul’s patents. The counterfeit sling simply features a copy of the front side and has “MS4” in large letters. Both adapters are cast. The genuine adapter is noticeably smaller than the counterfeit. The Genuine adapter has a roughly textured flat black finish that is even and clean. The counterfeit has a satin grey finish that appears to be painted. In a few places, it looks like it’s built up and thicker than in other places. The slots that limit rotation in the genuine adapter are smaller than those found in the counterfeit. The openings themselves are larger in the genuine adapter. The genuine swivels won’t fit in the counterfeit adapter while the counterfeit swivels fit loosely in the genuine adapter. 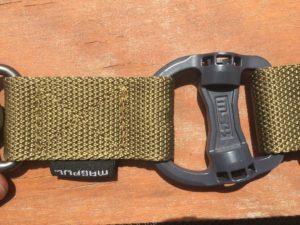 Next, each sling has a plastic tri-bar sliding length adjuster. On the top side, both read “MADE IN USA” on one side and “CAGE 1LX50” on the other. On the underside, the text is repeated on both sliders. It’s worth noting that the counterfeit slider it has glossy lettering and is significantly smaller in size than the genuine slider. This is where my two slings differ. 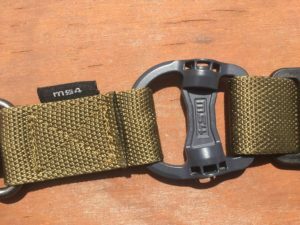 The counterfeit follows the design of the MS4 gen 1, while the genuine sling is an MS4 gen 2. I was unable to locate a genuine MS4 gen 1 for sale. The counterfeit sling features a large loop sewn onto another tri-bar slider while the genuine sling has a tri-bar slider and a coupler. Moving down the sling the genuine sling has a tag reading “MS1” and “MAGPUL” the counterfeit has no tag. 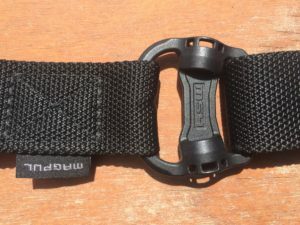 The genuine sling then has a large sliding adjuster that reads “MAGPUL“ on one side and “MADE IN USA CAGE 1LX50 PAT. PEND. 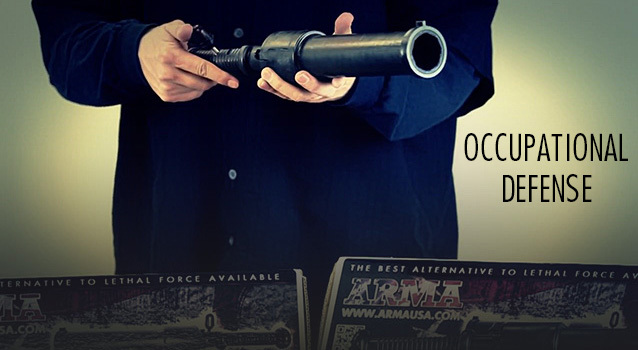 IP.MAGPUL.COM” on the other. Both slings end in a QD stud. The nylon used on the counterfeit sling is floppy and has a glossy sheen. The genuine sling has a thick sturdy feel, and the nylon is a flat non-reflective black. It feels thicker and more durable. For anyone that skipped ahead, that last bit was the end of the super detailed descriptions. Yet again, the real, American-made product is clearly superior to the knockoff Chinese clone. Everything about the genuine sling is better. 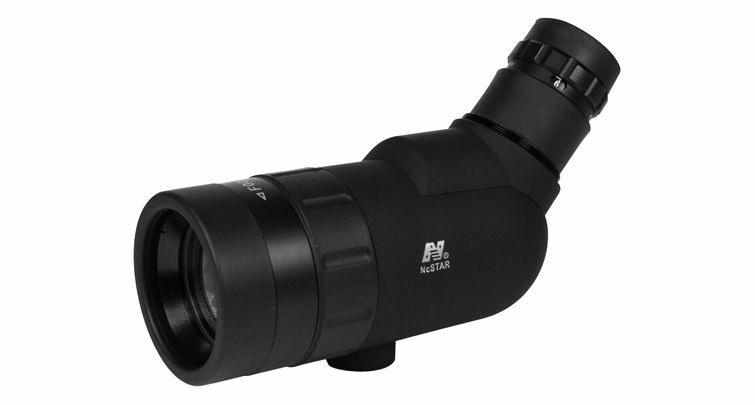 The sliders move more smoothly, the QD studs are stronger and more refined, the nylon is thicker and more rigid. 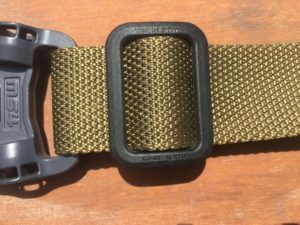 The genuine sling is without a doubt worth every penny over the knockoff sling. Buying the counterfiet does make me feel a little guilty, though buying the genuine sling may have absolved some of the guilt, or so I hope. Here you can see the thick grey pain that is present on the counterfeit’s adapter. It’s semi-glossy and looks like it could chip if you look at it wrong. The genuine sling’s adapter has a nice matte finish that looks like some kind of surface treatment rather than paint. The genuine sling’s sliders are all clearly labeled with clean text on the bottom. The counterfeit’s sliders are harder to read. The text is shallow.